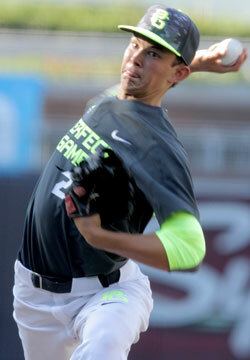 No pitcher performed better at the Perfect Game National Showcase than Gowdy. The lean, athletic righthander has tremendous physical projection and already has an adept feel for repeating his delivery that allows for advanced command of three pitches. Gowdy pounds the bottom of the strike zone with a 90-94 mph fastball that shows big downhill plane, and has very good feel for a biting low-80s curveball and a deceptive low-80s changeup.